If you are interested in getting involved in any of these activities, please send us a message via the contact page. 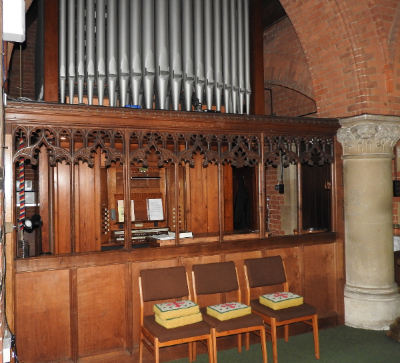 Our organ was supplied by Henry Speechly & Sons and was built in 1882. During 2017/18 it has been completely restored. Our organist is Richard Seaton. If you would like tour of the newly restored organ, please take to Richard. We are a friendly and enthusiastic team who enjoy singing both traditional and modern church hymns. We warmly welcome all newcomers to join us at choir practice and Sunday services… so don’t be shy, give us a try! The Choir caters for a wide age range and encourages young members of our congregation to join. We are able to ensure our young members are still able to participate within both the Choir and their Sunday School or Pathfinder group during our Sunday services. Our choir is lead by Choir Director Katherine Bond Smith, and our Organist is Richard Seaton. We are fun and friendly! We often get together after singing for drinks, meet up for meals and occasionally sing ‘away’ gigs (e.g. at RSCM festivals). The Choir supports our 10am Sunday service plus additional special services as required. Choir practice sessions are 6.45pm ‘til 8.15pm on Thursday evenings. Our traditional service of 9 Lessons and Carols will be on Sunday 23rd December this year (at 6pm). The day before Christmas Eve - what wonderful timing for getting into the festive mood! We had many fantastic extra singers join us last year, and I am really hopeful that even more of you will decide to give it a go this year. For many of us, it’s the music at Christmas that really gets us into the spirit of things and makes us feel ‘Christmassy’. The carol service at St John’s is always very well attended by people from Crowthorne and beyond. I would love to see even more people take the opportunity to gain experience of singing in a choir. This year, I would especially love to welcome parents with their children to choir rehearsals. Come along and enjoy learning and achieving together. We will begin rehearsals on Thursday 1st November at 7:30pm in the church, when you will be provided with music for use in rehearsals. We will meet every Thursday evening to prepare for Christmas and would love to see you! Not sure if you’re good enough? I am always so saddened when people tell me they love to sing, but that they feel they’re not good enough to join a choir. Often this stems from teachers or choir leaders having said so in the past. Yes, there is a level of dedication necessary to learn a new piece of music, but when you’re part of a supportive team all working together, it’s amazing what you can achieve. In a choir, each individual voice becomes a small part of the whole sound, so it really isn’t about having a fantastic singing voice! Far more important is your commitment to listen and learn in rehearsals and the desire to achieve the best as a collaborative group. You only have to think of all the choir and singing group initiatives that have been on TV in recent years to appreciate the satisfaction choir members can enjoy. So, if you’re curious and fancy having a go, please do stop me for a chat at church or around the village, drop me an email choir@crowthorneparishchurch.org.ukor just turn up on Thursday 1st November at 7:30pm in the church! The servers normally comprise a crucifer, who carries the cross, a server and two acolytes. The servers set out the altar for the eucharist, and water for the celebrant to wash their hands, light the candles and then lead the choir and ministers into Church at the start of the service. They hold the Bible for the Gospel reading, take up the offertory, assist the president with the bread and wine for the eucharist and ring the eucharistic bell. The Sacristans ensure that the Church has sufficient supplies of candles, wafers and wine. They put out appropriate altar and pulpit frontals to match the liturgical colour of the season. They prepare the chalices and wine cruets to be used in the services. It is a very special experience to share in the worship in this way. We welcome new people to join us in the team. The welcome team will greet people as they arrive, provide hymn books and orders of service, direct parents to our Sunday School (called "The Net") or creche. They can also provide bags of books for young children who prefer to be in the service. After the service they collect the books and direct newcomers to the hall where coffee/tea are served. We have a very talented team of flower arrangers, who decorate the Church every week. apart from during Lent and Advent. It is a delight to see the beautiful arrangements throughout the year. Do you have a special Birthday, Anniversary or event such as a Baptism that you would like to celebrate with Church Flowers? The flower arrangers would be pleased to provide Altar and Porch flowers and, if appropriate, we could include an announcement in the weekly newsheet. The arrangements are normally in Church for two weeks and they would need as much notice as possible of your requirements. We would like to take this opportunity to thank those generous individuals who donate money for flowers at our special festivals such as Christmas, Easter, Harvest. We are a group of singers who have fun singing songs we all love and offering them up to God in worship. We also love sharing our songs with people whether it’s at a special service in Church, out on the Morgan Rec at the May Fair, with the residents of Oak Lodge or the shoppers at Holme Grange. Any excuse, we’ll sing! This year we also had the pleasure of singing at Hannah and Matt’s wedding which was really special. Our rehearsals take place on a Wednesday evening in the Church Hall from 7pm for about an hour. As well as using downloaded backing tracks, we also sing acapello or accompanied by an acoustic guitar. We don’t read music – we feel the music. When we first start learning a song, we tend to just sing the melody. But what we find over time is that the song develops in its own special way (we call it “being GLorEEfied!”) with different harmonies and changes in tempo and sometimes even words. 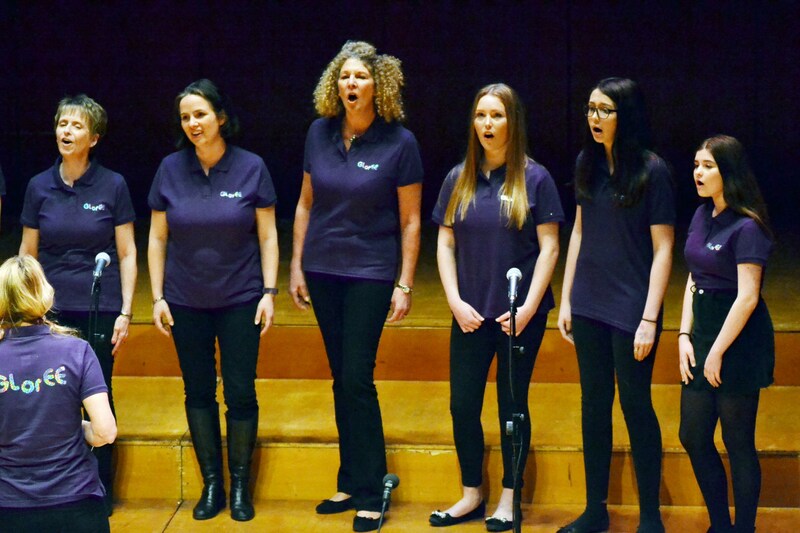 GLorEE represented St John’s Church Crowthorne at the final of Let’s Sing Reading Choir Competition at the Hexagon in Reading on 1st March 2017.